Create your own custom magnets! Quick and easy with our magnetic laminating pouches! Simply insert your print into the pouch, then run it through a thermal pouch laminator to seal your image onto the magnet. 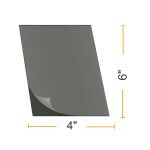 Available in multiple sizes with a clear gloss or satin film.